Richard George Rogers, Baron Rogers of Riverside (born 23 July 1933) is a British architect noted for his modernist and functionalist designs. He was born in Florence in 1933 and attended the Architectural Association School of Architecture in London, before graduating from Yale University in 1962. At Yale he met fellow student Norman Foster and on returning to England he set up architectural practice as Team 4 with Foster and their respective wives Su Rogers and Wendy Cheesman. They quickly earned a reputation for high-tech industrial design. 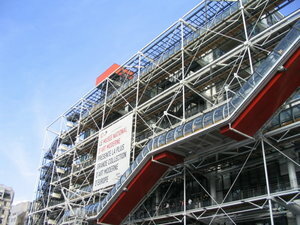 In 1967 the practice split up, and Rogers joined Renzo Piano winning the design for the Pompidou Centre in 1971. This building established Rogers' characteristic style in which most of the building services (water, heating ducts, and stairs) were exposed on the exterior to leave uncluttered internal spaces. Today the building is a highly admired Paris landmark, but at the time critics were more mixed, dubbing the new inside-out style "bowellism". He was awarded the RIBA Royal Gold Medal in 1985. Rogers was one of the most vocal advocates of the Millennium Dome project and his reputation has suffered as a result. Though still regarded as one of the major international practices it is notable that since the Dome he has secured fewer landmark projects. After several years of development the ambitious Rogers Masterplan for the regeneration of Newcastle-upon-Tyne was rejected. Rogers has been active politically as a Labour life peer and in 2000 wrote the UK government's Urban Renaissance white paper. Rogers is current chairman of the Greater London Authority panel for Architecture and Urbanism. Rogers' second wife is Ruth Rogers, co-owner of The River Café (also designed by Richard Rogers) and author of a series of popular cook books on Italian food.